​It’s mid-October. In public education in the United States, this is the time of year where many school staff wonder what they have gotten themselves into. Teachers are typically 6-10 weeks into the school year, and the honeymoon phase has worn away. This week I have heard from many friends, colleagues, and staff about the stress they are experiencing and the wonder if they are good enough to be in the classroom. Talking with my friend and my own experience today reminded me that my life is not measured by the work I produce. It is measured by the way I treat people and how I make them feel. This especially includes my husband, family, and close friends who have frequently gotten the short shrift in my recovering workaholic life. My wish for my fellow educators this month is that we all take some time to put on our oxygen mask first. Let’s break free from the cult of productivity and busy-ness and embrace that we are enough. Let’s model showing our students and staff that they are more than just their test scores or grades and consider how we can show the strength of our character to them by practicing kindness and care. One year ago I completed my research and dissertation on mindfulness based interventions for students with disabilities. As part of my research on mindfulness, I also committed myself to studying and practicing it personally over the past 3 years. I used apps, primarily Headspace and Insight Timer, for the majority of my self-practice. I listed to many great podcasts to gain deeper insight into my practice including 10% Happier with Dan Harris, Tara Brach, and the Metta Hour with Sharon Salzberg. I also attended a week long seminar in Germany at a monastery that served a dual purpose of helping refine my research and allowing me to experience hours of meditation under the guidance of expert practitioners. And, then I completed my dissertation, provided several presentations on my work, and…stopped. I am not entirely sure why I stopped meditating each day, but it happened around January. One of my New Year’s resolutions was to not read any self-help books or engage in anything that felt like it was being marketed using female lifestyle empowerment brand tactics. Instead, I wanted to practice listening to my body more intently and rolling with what it needs rather than overtly prescribing a strict course of “preventative measures”. Ironically, this listening to my body was the most mindful practice of all: paying attention, non-judgmentally to what I was experiencing. At this point in my life, I am no longer sitting on my meditation cushion for 20 dutiful minutes each day, but there are many mindfulness practices I continue to use that work well for me. I am sharing this now because I have heard many people say that they feel like they cannot call themselves a mindfulness practitioner because they are unable to meet some sort of artificial time milestone each day. You can give yourself permission to practice mindfulness in other ways. May you know peace in your life. I frequently tell people that I am a recovering perfectionist. I have lived the majority of my life afraid to let people down and living in shame whenever something was not perfect. From Tara Brach’s book Radical Acceptance, I learned how to better engage in self-acceptance. As Tara Brach puts it, “When we say, ‘I accept myself as I am,’ we are not accepting a story about a good or bad self. Rather, we are accepting the immediate mental and sensory experiences we interpret as self” (p. 41). When I notice that I may be starting to attach judgment to myself, I remind myself that I can tell a different story. I can practice radical self-acceptance and love. I stopped weighing myself last year (perhaps more on this later), but I bought a FitBit this spring as a tool for noticing my body (primarily my heat rate) and have loved the deep breathing function of my FitBit. In two minutes, I can engage in a quick relaxation technique to help decrease my stress and re-center. While I have been using my FitBit frequently for this, the same function can easily be accomplished in a low tech way by closing your eyes, quieting your mind, and staying present on the breath for a period of 1-5 minutes. When work feels stressful or I find myself starting to wander away from the task at hand, I have started engaging in a quick walking meditation practice. I intentionally and slowly walk from my office on the second floor down to my office building’s basement, and then back upstairs. I often stop by the kitchen in the basement and fill my water bottle up. I do all of this while engaging my different senses. The whole experience takes about 5 minutes, but I frequently find that it is all I need for a reset of my day. I remember as a teenager being deeply moved by music lyrics. I would lay on my bed and carefully study the CD lyrics jacket (admitting my age here) or close my eyes and focus on the layers of the song on the radio. Somewhere along the way I told myself a story that this was silly and not for grown-ups. Now, I give myself permission to have the sensory experience of music again. I have been enjoying playing a song that seems to speak to me and sitting in stillness with it. I love to do this when I get home from work as a transition from my professional to personal life. While I am not currently spending much time on my meditation cushion, I believe these practices have had a huge effect on my happiness and well-being. Are there any small practices you incorporate into your day related to mindfulness? Denial: Nah, it won’t happen. There’s no way so many Republicans would vote for her. Anger: What the f***. Seriously? Do people just hate our nation’s children? Bargaining: I (irrationally) contemplated never having children as my own way to sacrifice for the public school system. Huh? I don’t know what I was thinking here. Acceptance: Well, if that’s how it is going to be, then I might as well get in on the action. I can start my own for-profit education venture and rake in the dough. It’s all about state education systems. With the new Every Student Succeeds Act (ESSA), a lot of education policies have shifted from the federal government to the states. In my opinion, this is a great silver lining that we can use to our advantage. Currently, states are hard at work to create their plans on how they will meet ESSA requirements. This is a great place for us to use our voice to make sure that our states are supporting public schools appropriately. Parents have real power. We would not have special education laws without the advocacy groups that parents of children with disabilities created in the 1960s and 1970s. We will need parents to again come together to put pressure on legislators at both the state and federal levels. We also need parents to run for local school boards, so that they can help shape and maintain quality teaching. Use the courts and litigation. We may be able to get bad policies nullified or rejected through the court systems as we are seeing with the Muslim Ban. The courts have long been champions of public education, especially for children with disabilities, and we should be open to using these as a way to create change. Educators need to become political actors. It is time to put down Pinterest and TeacherPayTeacher for a moment and to start becoming political advocates. Yes, it is super scary to step outside of our schools and to lobby our political systems, but we need to make our voices heard, so that special interest groups don’t fill our silence with their garbage. Start by calling your representatives or inviting them into your classroom to discuss the needs of your students. Think about how you can help your students to also actively engage in the political system. On a more tactical level, we can also fight back against the implementation of education policies that will hurt our children. Malen (2006) recommends using “various combinations of simple neglect, subtle adaptation, overt resistance and creative defiance” to undermine new initiatives (p. 96). This may mean things like opting out of state testing, refusing to implement certain curriculum, or active resistance against the inevitable widening of voucher programs and for-profit charter schools. ​What actions are you going to take to support our public schools? How can we all step up to collectively make sure every child is able to receive a high-quality, public education in the United States? Malen, B. (2006). Revisiting policy implementation as a political phenomenon: The case of reconstitution policies. In M. Honig (Ed. ), New directions in education policy implementation: Confronting complexity (pp. 83–104). Albany, NY: State University of New York. This article first appeared on Medium on 2/7/2017. ​On Tuesday, I watched with horror as Betsy DeVos went through her confirmation hearing. DeVos has zero experience as an educator, school administrator, or even as a public school parent. 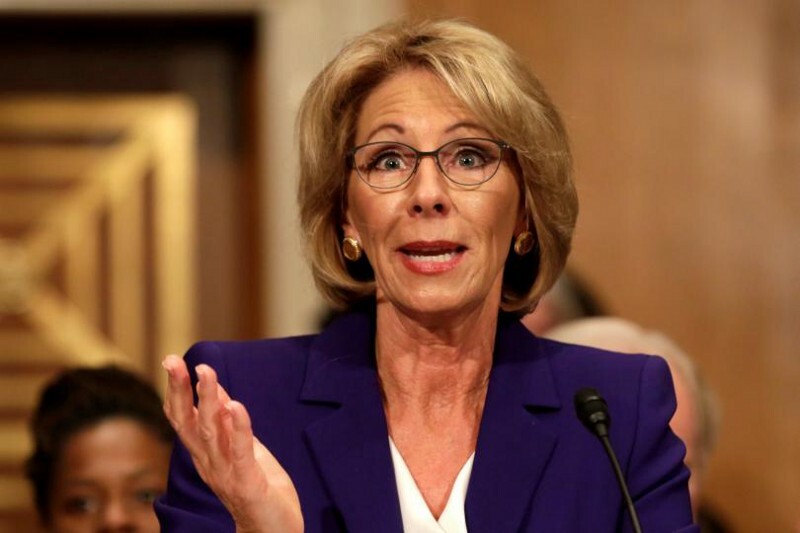 From not being able to understand the difference between growth versus proficiency in student achievement to not realizing the Individuals With Disabilities Education Act (IDEA) is a federal law, her inability to lead the Department of Education was evident at every step in the hearing. In fact, I would not even hire Betsy DeVos to be a first-year teacher. I expect all teachers, not even just special education teachers, to understand one of the few federal education laws, especially one that has been in existence for 40 years. When confronted with ethical dilemmas as an educator, I have often asked myself whether I would do this for my own child to be an important decision making strategy. When it comes to Betsy DeVos, I would not want her teaching my child, let alone making decisions for the millions of children and adults attending K-12 or higher education institutions. If you agree with me and also have concerns about her, then please complete this 1-minute form to tell your Senators to vote no on her confirmation. This week I was interviewed on a topic very close to my heart: salary negotiation! Check out my interview here on the Bossed Up website -- an organization with a mission to help women beat burnout and achieve career success. Afterwards, read about why I chose to give up my offer here, so that I could take a part-time job that better aligned with my career. Three years ago I sat in a dorm room at the National 4-H Center at the end of an exhausting summer of leading camps across the United States. I was a few days away from wrapping up our final camp and I had stumbled across the 1930 essay by John Maynard Keynes, Economic Possibilities for our Grandchildren (free PDF). ​In this article, Keynes predicts that we will only need to work about 3 hours a day by 2028 and discusses (read: warns about) what will happen when we begin to have more leisure time. ​I'd traded my prized teacher's summer off for a few thousand dollars to run these camps, and I had no idea why. I wasn't planning to use the money for anything special. To this day, I have no idea what it actually went towards. I put the article away and went on with business as usual: working a full-time role that requires me to constantly be "on" and pursuing my doctorate. The stress of around the clock work has caused me to lose friendships, jeopardize my health, and to forget what brings me joy. So, I am putting a stop to the madness. I've traded in my full-time role with a great school network to work part-time next year with an equally great special education organization to deliver training and school support. I'm going to start measuring my success not in wealth, but in time. I'm rejecting the status symbol of a busy calendar in favor of reclaiming my leisure time. And more importantly, I am taking my teacher's summer for the very first time and plan to do nothing but travel, visit friends, write, and relax. Today, under the cover of night, Republicans added a provision to the Wisconsin budget that would allow someone without even a high school diploma to become a special education teacher (in addition to 12 other subject areas) (Wisconsin Department of Public Instruction, 2015). This provision would put Wisconsin at literally the bottom of teacher quality standards for all 50 states. Wisconsin’s education system appears to be on its own dizzying Race to the Bottom as it adopts policies that are in direct contradiction to those of top school systems around the world such as Finland and Singapore. For example, countless research studies have found that teacher quality is the single most important influencer on academic achievement aside from socioeconomic status (Donaldson, 2012). Finland’s teacher licensing standards are actually similar to Wisconsin’s current standards where teachers major in education and minor in a subject area (Sahlberg, 2013). Why would we mess with our licensing standards when they are so similar to the top country in the world in education? The way to create a great education system for Wisconsin’s kids is through high professional standards for teachers, not by making it possible for literally anyone to become a teacher. Research shows great school systems give teachers the autonomy to plan and implement lessons and to create their own student assessments (Sahlberg, 2013). Instead, Republican Wisconsin legislators have planned for more state control over curriculum by allowing for state takeover of schools, and increasing standardized testing. This year alone I spent over 30% of my time as a teacher proctoring state mandated standardized exams. I cannot imagine what “learning” will look like as more tests are piled on our children. Over the past year, I have witnessed what used to be one of our country’s best educational systems continue its downward spiral since Governor Walker took office. As I look to have children of my own over the next few years, I know with good conscience that I cannot subject them to the mediocre education system that will be in place in Wisconsin. Today, as Republicans continued their assault on public education in Wisconsin, I signed a lease on a new apartment in Minnesota. I promise to remain a faithful Packers fan. Sahlberg, P. (2013). Teachers as leaders in finland. Educational Leadership, 71(2), 36-40. April is National Poetry Month, so I have decided to challenge myself by writing a poem today. 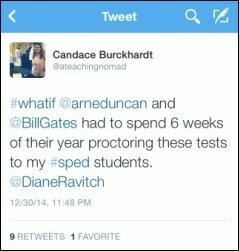 This tweet has been staying in the forefront of my mind the first week back to school as my students gear up for Round 2 of district mandated NWEA testing. I don't think the public truly understands the sheer amount of time we spend testing at school, so I've added up the hours I have spent/will spend testing my special education students this year. NWEA Testing: It takes myself and one of my assistants ten days straight to test all of our students each time we take this test. This equates to roughly 180 hours of my time each year. AIMS Web Testing: Our district mandates that I progress monitor each of my special education students in both reading and math on a biweekly basis. This roughly equates to 60 hours over the course of the year. WKCE Science & Social Studies Tests: This took me 5 hours to give. WAA: This took me about 4 hours to proctor. Smarter Balanced Assessment aka Badger 3-8: This is a new test, but the students have to take it individually. The average time for a non-special education student according to the Smarter Balanced folks is 7 hours per students. Typically, my students take at least 50% longer than their peers, so I will schedule about 10 hours for each of my students. It will be proctored to 15 kids on my caseload, but fortunately some of my assistants will be able to help, so my guess is about 75 hours of my time. Dynamic Learning Map: It is super unclear how long this test will take for my student with cognitive challenges, but I did have to sit through 3 hours of training on how to proctor it. My guess is it will take about 4 hours to proctor. Total hours of my time: 7. Total hours of testing: 334 hours. It's time for me to go back to school and that can only mean one thing: required district "professional development". When I first started teaching six years ago, I was shocked by the veteran teachers who rolled their eyes and talked in disgust about professional development. Now I have become one of those same veteran teachers who hates this time of year. Is it because I think I know everything? No, absolutely not. I'm going to school for a doctorate in education right now. I read the latest education research every night with glee. My life is spent talking with colleagues about ideas and watching the latest webinar on things like visual schedules and digital icebreakers for back-to-school (which I'd recommend trying this year). I love improving myself professionally. - General district stuff including awards and announcements, an update on our insurance, union meetings, 2.75 hours to work in our classrooms, and our elementary open house. Summary: Only 4.75 hours will be devoted to actually improving my classroom and skills as a teacher (done by collaborating with another teacher). The remaining 21 hours (82%) will be spent either talking about being evaluated, random nonsense I could read in an email about the district, or how to torture/give even more standardized tests. Yes, I understand that it is important to teach our staff about their evaluations, upcoming tests, etc., but these things could be done in other ways, and I truly wonder if the amount of hours we spend talking/training on these things really has any causal impact on student achievement. 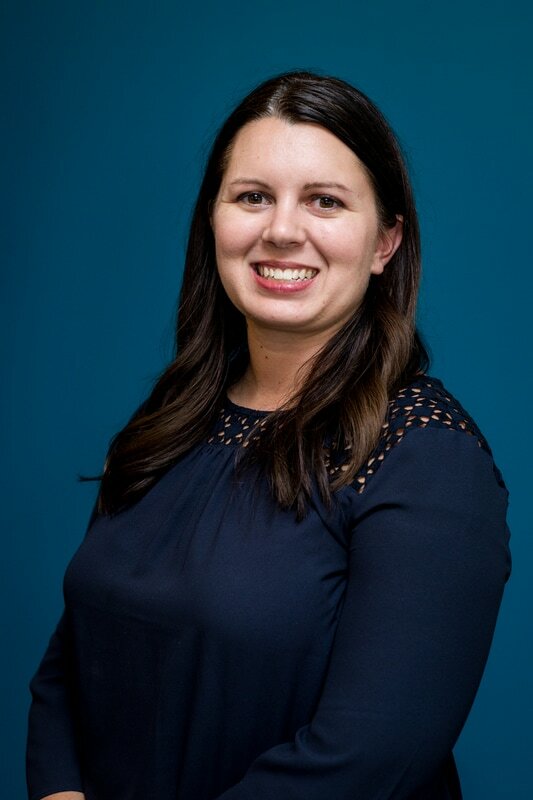 Candace Burckhardt is an international education consultant with an emphasis on special education, English learners, and social-emotional learning.